Group multiple opportunities together and quote for them all at once using a project. Set an organization, dates, addresses, and other details against the project. Add opportunities to the project with different venues and rental periods – great for roadshows or tours. Create a project quotation to quote your customer for all opportunities in the project. Create an invoice for all or some of the opportunities in the project to bill your customer on a single document. Manage the logistics and warehouse operations for each opportunity separately. 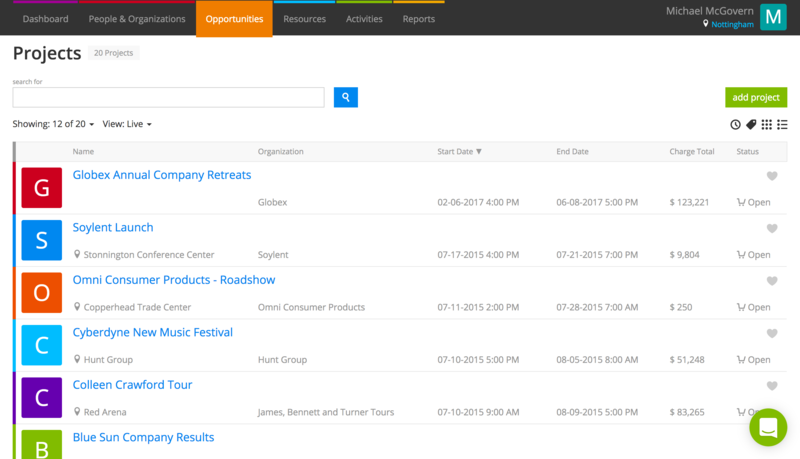 Use the project detail view to check-in assets across all opportunities within the project. For events that happen over multiple locations, you can create an opportunity for each venue and rental period and add them to a project. For jobs with distinct areas like stages or rooms, create an opportunity for each area and add them to a project. If you’re working for a customer who’d like to see multiple options for an event, create an opportunity for each option and pull off a project quotation. Mark options that aren’t going ahead as dead. There might be cases where you’re suppling gear to one organization, but need to bill another. Set the organization you’re supplying to on opportunities and the billing organization against the project. Do I have to use projects? No. You can create opportunities independently of projects.